Astroblastoma is a rare glial neoplasm whose histogenesis has been clarified recently. It primarily occurs in children and young adults. We are reporting a case of 12-year-old girl child who presented with features of raised intracranial tension and generalized tonic-clonic seizures. 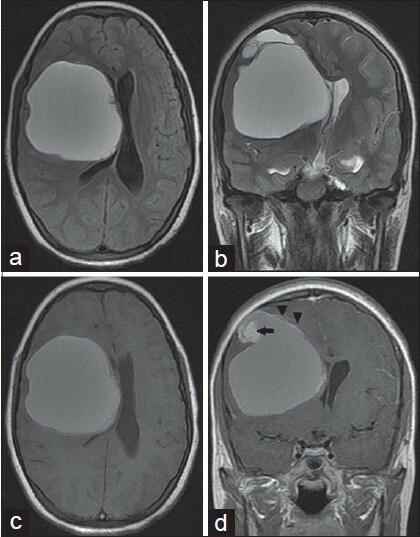 Brain magnetic resonance imaging revealed a large well-circumscribed, cystic lesion without perifocal edema, and enhancing mural nodule in right parietal region. A radiological differential diagnosis of pilocytic astrocytoma and cerebral astroblastoma was made. A complete excision was done and histologically the lesion turned out to be an astroblastoma. We review the histology, immunohistochemistry, and imaging features of astroblastoma and survey the current literature, treatment strategies, and prognostic aspects for the management of this rare neoplasm. Astroblastomas are uncommon neoplasms of uncertain origin, constituting 0.45%-2.8% of all neuroglial tumors. These lesions are prone for misdiagnosis as they share radiopathologic features with other neuroglial tumors and their rare occurrence in clinical practice. This article describes the case of a young girl with a large supratentorial cerebral astroblastoma with its clinical, radiological, and pathological features. A 12-year-old girl child presented with episodes of generalized tonic-clonic seizures for 6 months and headache and episodic vomiting for 2 months. Neurological examination did not reveal any significant abnormality. Bilateral papilledema was detected on fundoscopy. Routine blood and biochemical investigations were within normal limits. Brain magnetic resonance imaging (MRI) revealed a large well-defined predominantly cystic lesion without perilesional edema in right parietal region extending from cortex to periventricular region with mass effect in form of effacement of overlying cortical sulci, ipsilateral sylvian fissure, and lateral ventricle with significant midline shift towards left. The lesion was hyper intense on T2 fluid-attenuated inversion recovery (FLAIR), T2- and T1-weighted images (WI). Foci blooming on gradient recoiled echo images were noted at the periphery of lesion suggestive of calcifications. Gadolinium administration demonstrated peripheral enhancement of the lesion with strongly enhancing mural nodule [Figure 1] Based on these findings, differential diagnosis of pilocytic astrocytoma and cerebral astroblastoma were made. The patient was operated under general anaesthesia. A right parietal craniotomy was made and gross total excision of tumor was achieved. The tumor was largely cystic with small soft, vascular, and suckable solid component. The tumor was well-demarcated from the surrounding brain without any areas of hemorrhage or necrosis. Patient made an uneventful recovery in the postoperative period and there was no additional neurological deficit. Histopathological examination of tumor tissue revealed perivascular arrangement of cells with short stout cytoplasmic processes anchored to blood vessel walls (pseudorosettes) without any evidence of necrosis, mitosis, or vascular proliferation. Tumor cells were spindle shaped having moderately eosinophilic cytoplasm and eccentrically placed nuclei with strong immunopositivity to glial fibrillary acidic protein (GFAP), vimentin, and S-100 [Figure 2]. Based on these findings, a histopathological diagnosis of low-grade cerebral astroblastoma was made and patient was referred for adjuvant radiotherapy. Astroblastoma is a rare tumor of glial origin that occurs most frequently in older children or young adults. These lesions were first described by Bailey and Cushing  in 1926, and their statistical analysis was supported by Bailey and Bucy in 1930. These tumors are classified as neuroepithelial tumors; however, lack of sufficient clinicopathological data thwarts the World Health Organization (WHO) grading of these tumors. , The cell of origin of astroblastoma is still arguable but broadly accepted to be the astroblast − an intermediate cell between spongioblast and astrocyte. Yao et al., has recently published a case of 36-year-old man with astroblastoma-arteriovenous malformation complex at same location and concluded the possibility that the vascular needs for astroblastoma growth were most likely partly supplied by the arteriovenous malformation (AVM) and that their concurrent finding in the same location in the brain was probably determined by a common genetic and molecular basis. The studies performed till date show striking female preponderance with a male to female ratio of 1:11. Most commonly patients present with features of raised intracranial tension, drowsiness, and seizures. Astroblastomas are usually supratentorial neoplasms; however, these have been rarely reported in infratentorial locations like cerebellum, brainstem, and extracranial sites like optic nerve and cauda equina nerve roots. , In cerebral hemispheres, occipital and frontal lobes are the most frequently affected sites. Major radiological differential diagnosis of astroblastoma is ependymoma, astrocytoma, and oligodendroglioma. Ependymomas can be differentiated by their predilection for infratentorial intraventricular or periventricular locations. If located supratentorially, moderate perilesional edema is usually seen and the solid component lacks the characteristic "bubbly" appearance seen with astroblastoma. Anaplastic astrocytoma and glioblastoma are associated with marked perilesional edema and cystic appearance is caused by central necrosis. Oligodendrogliomas are rare tumors that may appear bubbly due to foci of cystic degeneration but 70%-90% of these lesions show nodular or clumped calcifications, in distinction to the punctate calcifications seen in astroblastoma. Imaging of our case shows a large cystic lesion with peripheral punctate calcifications and enhancing mural nodule, extending from cortex to periventricular region so differential diagnosis of pilocytic astrocytoma and astroblastoma were kept. Astroblastomas show strong immunopositivity for GFAP, S-100 protein, and vimentin. Bonnin and Rubinstein  categorized these tumors into low-grade and high-grade astroblastomas. Low-grade astroblastoma were characterized as well-differentiated tumor with perivascular pattern, little cellular atypia, low to moderate mitotic figures, and prominent sclerosis of the vascular walls. These lesions have an indolent course and patients may have long-term survival after total resection. High-grade astroblastomas had anaplastic features, high cellularity, cytological atypia, a high mitotic rate and endothelial hyperplasia without sclerosis of the vessel walls. These tumors are more aggressive and can transform into glioblastoma-like tumors. Histological features in our case were consistent with low-grade astroblastoma. The ideal management of astroblastoma remains to be defined. Favorable prognosis is almost always associated with well-circumscribed tumors, which permits total resection. Given the peripheral location of astroblastomas, total resection seems a goal easier to achieve than in other gliomas. Close follow-up of all cases and adjuvant therapy for high grade and recurrent cases is recommended. In low-grade astroblastomas radical surgery may be the only necessary treatment, though we have given adjuvant radiation in view of nonstandardization and reports of early recurrence even after radiologically complete excision. The lack of enough information about the natural history favors the use of adjuvant radiotherapy from the beginning. Ahmed et al.,  have recently published the largest series of 239 patients and concluded that supratentorial location, age >60 years at diagnosis and treatment before 1990 were correlated with decreased survival. However, continued clinical studies and longer patient follow-up with a tumor-based registry would further clarify the real behavior of astroblastoma and its optimal management. 1. Bailey P, Cushing H. A classification of the tumors of the glioma group on a histogenetic basis with a correlated study of prognosis. Philadelphia: J.B. Lippincott Company; 1926. p. 134-67. 2. Bailey P, Bucy PC. Astroblastomas of the brain. Acta Psychiatr Neurol 1930;5:439-61. 3. Louis DN, Ohgaki H, Wiestler OD, Cavenee WK, Burger PC, Jouvet A, et al. The 2007 WHO classification of tumours of the central nervous system. Acta Neuropathol 2007;114:97-109. 4. Salvati M, D′Elia A, Brogna C, Frati A, Antonelli M, Giangaspero F, et al. Cerebral astroblastoma: Analysis of six cases and critical review of treatment options. J Neurooncol 2009;93:369-78. 5. Yao K, Li TF, Zhu MW, Duan ZJ, Liu CQ, Wang JQ, et al. Mixed astroblastoma-arteriovenous malformation complex: A case report. Neurol India 2013;61:439-42. 6. Bell JW, Osborn AG, Salzman KL, Blaser SI, Jones BV, Chin SS. Neuroradiologic characteristics of astroblastoma. Neuroradiology 2007;49:203-9. 7. Grotts BF. Astroblastoma of the cerebellum in an infant; report of a case. Arch Pediatr 1949;66:283-8. 8. Notarianni C, Akin M, Fowler M, Nanda A. Brainstem astroblastoma: A case report and review of the literature. Surg Neurol 2008;69:201-5. 9. Furie DM, Provenzale JM. Supratentorial ependymomas and subependymomas: CT and MR appearance. J Comput Assist Tomogr 1995;9:518-26. 10. Port JD, Brad DJ, Burger PC, Pomper M. Astroblastoma: Radiologic-pathologic correlation and distinction from Ependymoma. Am J Neuroradiol 2002;23:243-7. 11. Bonnin JM, Rubinstein LJ. Astroblastomas: A pathological study of 23 tumors, with a postoperative follow-up in 13 patients. Neurosurgery 1989;25:6-13. 12. Caroli E, Salvati M, Esposito V, Orlando ER, Giangaspero F. Cerebral astroblastoma. Acta Neurochir (Wien) 2004;146:629-33. 13. 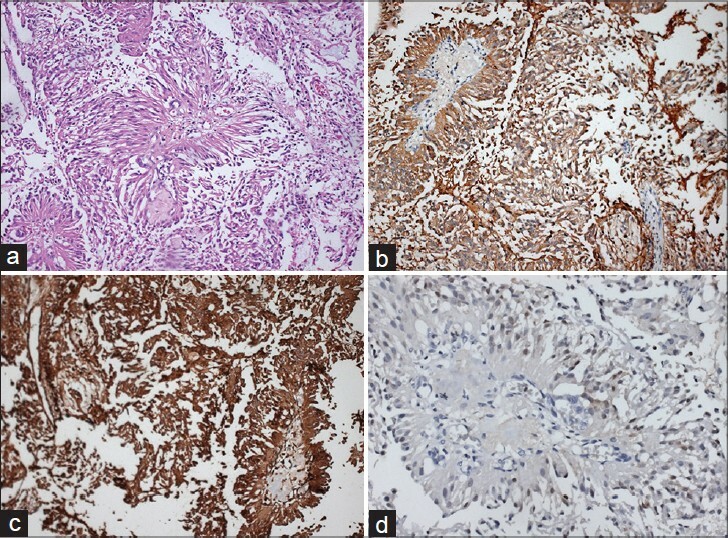 Cabello A, Madero S, Castresana A, Diaz-Lobato R. Astroblastoma: Electron microscopy and immunohistochemical findings: Case report. Surg Neurol 1991;35:116-21. 14. Ahmed KA, Allen PK, Mahajan A, Brown PD, Ghia AJ. Astroblastomas: A SEER Based Patterns of Care Analysis. World Neurosurg 2013.